DC Universe Animated Original Movies - SUPERMAN: UNBOUND | Warped Factor - Words in the Key of Geek. 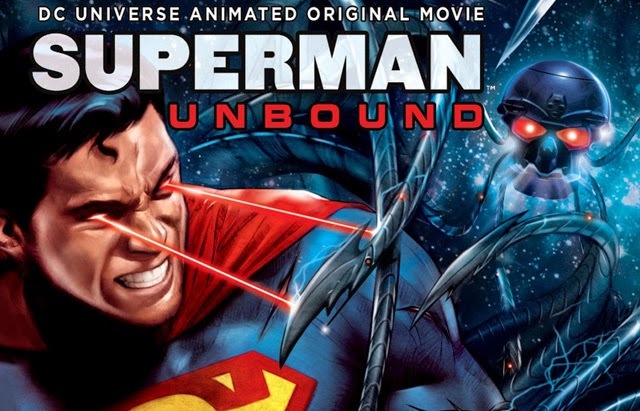 Da'Mon Guy looks back at the 2013 DC Comics animated movie, Superman: Unbound. Superheroes are our modern mythology. The characters that grace the pages of the funny books have come to dominate both the big and small screen's, and in the process of doing so have endeared themselves to their hearts of their fans. The many characters of DC and Marvel Comics have become common names that most children know even before they learn the ABC’s, with Superman arguably being the most well known of them all. Superman: Unbound is an action-packed, multifaceted showcase that is a terrific intersection of an action story, science fiction, and romance. This is an animated feature that delves into the core of what makes the Man of Steel tick. In addition, it’s an extremely human story of the world’s longest tenured superhero. The film is based on the 2008comic book story Superman: Brainiac by Geoff Johns and Gary Frank, and features the voice talents of Matt Bomer, Stacy Ketic, John Noble, and Molly Quinn. Superman: Unbound is one of the more sci-fi based stories featuring the Man of Steel, but it’s also one of the more “human” animated features that the character has appeared in. Superman squares off against Brainiac, one of his greatest foes. This animated version of Brainiac incorporates the look of multiple comic book versions of the character, and the whole movie itself manages to feature the look and feel of different elements from multiple incarnations of Superman. This includes the old Superfriends of the 70’s, the Super Powers Team of the 80’s, Superman the Animated Series, Lois and Clark: The New Adventures of Superman, and Smallville. It implements an extremely modern perspective on the Man of Steel by updating and modernizing many of the aspects of the Superman mythos, and to the Superman/Clark Kent Lois Lane relationship. It addresses the problems of Lois Lane attempting to find some semblance of a life with Superman, and Kal El's struggle for humanity whilst coping with living on Earth and having super powers. He's not the only Kryptonian in this movie, as Supergirl features prominently too. Superman: Unbound explores the differences between Superman and Supergirl in learning to cope with being of two worlds. While Superman feels more at home with the humanity and not truly belonging, he is feels the opposite when he confronts other Kryptonians, and vice versa for Supergirl. It sheds a new perspective on the relationship between Superman and Supergirl, it doesn’t make it out to be happy, smooth bond that has often been depicted in most other tales. Superman: Unbound is an enjoyable watch. It’s not the best animated Superman tale from recent years, in my opinion it ranks behind All-Star Superman, Superman: Doomsday, and Superman Vs Shazam. However, it’s still a good story of the World’s oldest superhero, and would make a good addition to anyone's collection. Da’Mon Guy is a writer and artist. He’s a graduate of Coppin State University and an avid, life-long lover of film. Da'Mon has been actively writing movie reviews since 2011, for a number of publications. Check out more of his work at Examiner.com, where he has published over 400 reviews. Visit his Blog and follow him on Twitter.